Home » Take Action: Congress Needs to Put Up the Money for the 2020 Census - Now! On, April 1, 2018 there will be a full-scale, “dress rehearsal” of the 2020 Census in Providence, RI. Typically, this end-to-end-test occurs in three areas around the country reflective of diverse populations. But, due to Congress’s failure to appropriate money for the 2020 Census in a timely manner and at the planned-upon levels, this test is only happening in one community. What’s more, delayed federal funding means the test is happening without any of the communication tools being developed for the 2020 Census; they have yet to be developed. Congress and the White House, in fact all elected officials need to know their failures are putting us on track for what some consider may be a “failed census.” The fiscal year 2018 and 2019 federal budgets are both still in play – right now. Because the federal government is still operating with a temporary budget (continuing resolution) there is an opportunity for additional FY 2018 funding. Plus, the 2019 budgeting process is now underway. A simple message works: "Fund Census 2020 with an adequate, timely, and predictable budget." Constituent voices are extremely important in determining an elected official's priorities. It just takes five calls/emails to elevate an accurate 2020 Census to be a focus area for your representative. Contact your representative now. Feel free to contact us at MCF if you need help. The Census Project provides monthly updates and periodic blog postings about the census. (look at the most recent about the about the rural undercount). Here is a summary of our key concerns challenging an accurate 2020 Census. Adequate, timely, and predictable funding to support 2020 Census key programs. The fiscal budgets for 2018 and 2019 are the final opportunities to get it right, but both FY budgets are below what is absolutely essential for the 2020 Count. FY 2018 Budget - the current Continuing Resolution ends March 23 (nearly six months into the fiscal year!). The Census Bureau needs $1.848 billion to help put 2020 Census planning back on track. 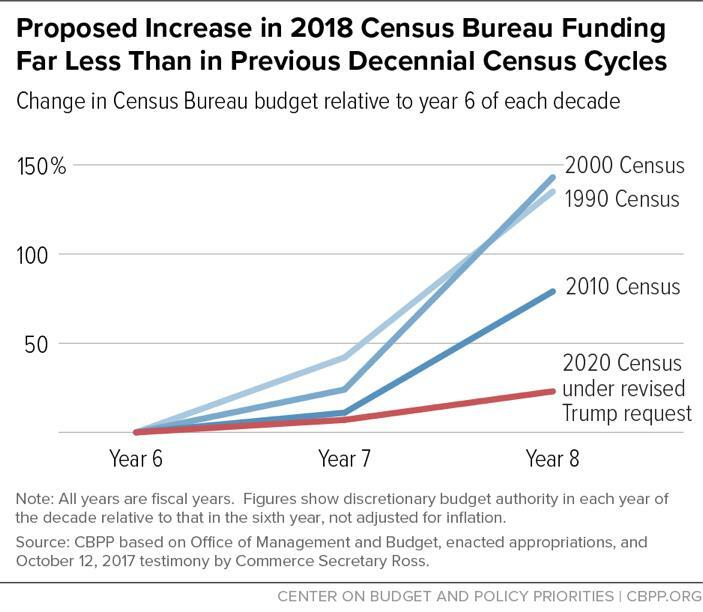 FY 2019 Budget --The Census Bureau needs ~$4.735 billion, which includes $3.928 billion for the 2020 Census and funds for keep-the-lights-on programs including measurements of the economy. IT systems to collect responses from 75 million households in the weeks around April 1, 2020. The stability of the online-response option (expected to be used by half of all households) in particular needs to be tested this year. Communications and partnership programs with local "trusted voices" are critical to reducing overall costs and getting out the count from the "hard to count" population (renters, low income, children, new Americans, communities of color). Field staff --- there are no plans currently for a field office in the western half of the state, only in the Twin Cities, Duluth, and Rochester. Indian Country and rural Minnesota will be especially at risk of an inaccurate count. Dry Run (2018 end-to-end test) completion and course correction based on the results. Complete the final questionnaire that has been developed and tested by census statisticians (nonpartisan professionals, the best in the world), not viewed through a political filter. A Proposed Department of Justice Citizenship Question would suppress response rates and harm Minnesota. The U.S. Constitution and the Supreme Court make clear that everyone must be counted in the decennial census. MACS 2020 does not support a Citizenship question. Nor do Attorneys General from 19 states, and Mayors (including Minneapolis, Minnetonka, Saint Paul and Duluth). Finally, the Census Bureau needs leadership. The former Director resigned in June 2017. The Census Bureau is operating without the visibility and support provided by a strong professional leader, essential to a good count. MCF convenes the Minnesota Census Mobilization Partnership (MCMP) to promote a fully-inclusive, fair, and accurate 2020 Census in Minnesota. Through MCMP, we partner with MACS 2020 on federal advocacy for the census and American Community Survey. This Policy in Focus post was developed by MACS 2020. Follow MCMP on Facebook and Twitter.